Home » Tor vs VPN—Why Not Use Both for Complete Security? Tor vs VPN—Why Not Use Both for Complete Security? What’s the difference between Tor and VPN? Should you choose one over the other, or can you use both at once? It’s no surprise that internet users are increasingly turning to Tor and VPNs today to guard their privacy and security. General awareness surrounding all things privacy has grown alongside major data breaches impacting millions of people that have made personal data more valuable than ever. In this precarious climate, Tor and VPN have become two of the best and most powerful tools that are widely accessible and provide unbeatable levels of protection when used properly. Although there are some similarities between Tor and VPN, they are two very different tools that have applications to different situations. We’re going to look at Tor vs VPN and consider when you would use one, the other, or both together. Tor—The Onion Router—is a non-profit service run and maintained by volunteers. 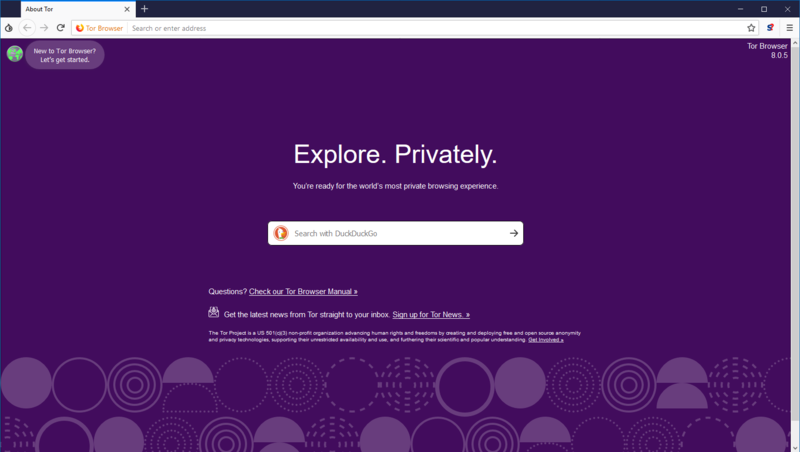 It was created to facilitate safe, anonymous browsing. It is used by journalists, human rights groups, and government agencies for intelligence gathering and safe communications with sources. Of course, it’s also highly popular with normal, average people who simply want to remain private online. Tor operates as a decentralized system where internet traffic is routed and relayed through a series of different network layers–servers run by volunteers–rather than going directly to its destination. This hides both your identity and location so no single server can know how and why you’re accessing the web. Usually, identifying the server will reveal everything about you from timestamps to location. But Tor makes that impossible since you’re not using a single server to go online, but a minimum of three to establish a connection. If you think of a server as a digital footprint, you can see why this would be so hard to trace. Imagine you’re tracking an animal in the forest, but all around you, you see different sets of footprints bouncing from one place to the next. Who is this creature, where did it come from, and where is it going? You simply won’t be able to tell. Accessing the Tor network is easy. It’s a piece of software you can install and use through a web browser. It’s like Google Chrome… only not as fast! The most obvious benefit of using Tor is that it hides your IP address from any sites you visit. The Tor Project is also active and regularly updated with safety features—it is by far one of the best tools for achieving anonymity online. The distributed network also makes it harder for hackers to take down the network. It’s not the same as attacking a centralized network where there’s a single location source. On the other hand, Tor can be quite slow, and it is notorious for compromising users who are visiting sites that don’t use SSL even though data is encrypted as it passes through each relay node. And because it’s run by volunteers, servers can be unreliable and outdated. Using Tor is limited to a select few devices. You won’t be able to use it on your router or iOS, for instance. It’s very easy, just like installing a web browser such as Google Chrome. 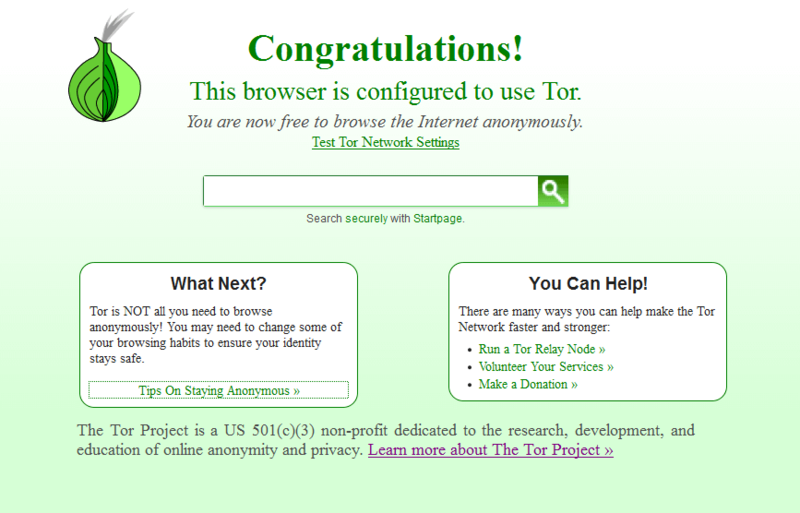 Head to the Tor Project website and select the download that applies to you. Install it using the installation wizard. Launch it and begin browsing. That’s it! Make sure you read the best practices and usage advice for Tor, especially if you are privacy-minded. A VPN—Virtual Private Network—also protects your privacy and identity when you use the internet. It does this by routing your traffic through a secure and encrypted server of your choosing. This causes your IP address to change and encrypts any information and data you’re sending or receiving. VPN servers can be located anywhere in the world. With the best VPNs, you can choose a server to connect to through an intuitive user interface. 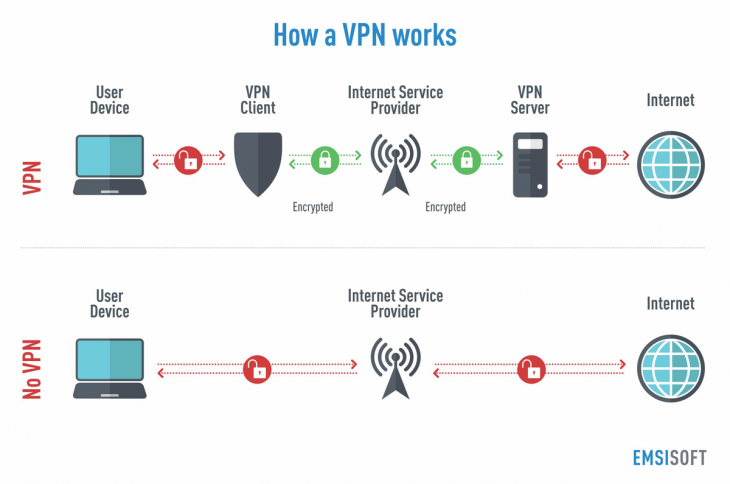 Once you’re connected to a VPN and start using the internet, your traffic is sent from your computer to the selected VPN server through a secure tunnel and then from the VPN server to its destination. When receiving your traffic, the same happens but in reverse. Basically, what you’re getting is a middleman, but you’re also taking on the identity and IP address of the middleman instead of using your own. Want to fool websites into thinking you’re a user from France? Just choose a server in France, even though you’re actually in England–and voila! We highly recommend using a VPN even for general day-to-day browsing. In a world where your data is a valuable asset, you should do everything you can to protect it. Generally speaking, quality VPNs are a one-stop-shop for all your privacy needs. They anonymize you by hiding your IP address, encrypting your traffic, and operating a no logging policy. Additionally, VPNs are so much faster than Tor and, in many cases, you get the same upload and download speeds when connected to a VPN as you would when you are not connected. The biggest drawback when comparing a VPN to Tor is the need to carry out research before settling on a VPN service so that you know it’s the right one for what you need. Although there are free VPN providers they are shady and full of viruses. The primary difference between a VPN and Tor is the way that they handle your traffic. With a VPN, you choose a premium server to connect to and remain on it until you either finish your VPN session or choose another one. When traffic is sent using a VPN, it is encrypted once before it leaves your computer through a secure tunnel to the VPN server where it is decrypted and sent to its final destination. In contrast, Tor uses a process known as ‘onion routing‘ that selects at least three random volunteer servers and bounces your traffic between them. Just like with a VPN, your traffic is encrypted several times before it leaves your computer and into the network—hence the name onion, because there are multiple encryption layers—headed for its destination. As your traffic reaches each server, one layer of encryption is removed. With Tor, you are relatively safe and anonymous within the Tor network. Anything that takes place outside of it, e.g. through IM apps, is not protected. Unlike a VPN, you don’t need to configure Tor in order to begin using it. There is no manual setup involved like there is with some VPN services. The major areas where VPNs trump Tor are device compatability and speeds–Tor can only be used on desktop devices or Android whereas many good VPNs can be used on other devices like games consoles and routers. While you can use a Tor and VPN together to maximize security, consider whether you really need to do this. If you do decide to use them together, you will sacrifice overall speed and performance. It does not matter how fast your download speeds are, Tor is inherently slow and randomly bounces your connection through many servers located across the world. There is no way to speed it up, even with the fastest of VPNs. Using a good VPN service and using it properly is almost always going to be a high enough level of protection. There isn’t really a need for you to use one alongside Tor unless you are browsing the ‘dark web’ and want an added layer of protection should Tor fail. While it is a safe and secure network, it is not fast enough to be used as a matter of course for day-to-day browsing, streaming, or torrenting. It’s true that using both Tor and VPN together will boost your security, but is it worth the slow speeds? That depends on what you want to do with Tor. Which VPN is Best for Use With Tor? Your ISP and government agencies do not know you are using Tor. Your IP address is protected when your traffic is decrypted. We chose NordVPN because not only do they provide a fast and reliable VPN service that won’t further slow down what is an already slow service (Tor), but they also have specialized Onion Over VPN servers that you can connect to when using Tor. These servers are optimized for Tor but you’re not required to use them. You can use any server you want with Tor. Of course, it’s best to test out NordVPN with Tor yourself rather than taking our word for it. Take advantage of their 30-day money-back guarantee or start your 7-day free trial!